Today is December 12th. It is my little sister's birthday. She is three years younger than I am. That is a big difference when a person is young. We are four grades apart because I was one of the youngest in my class and being born in December she had to wait until she was five to start school. She was also little and I was big. They used to call her PeeWee. Despite the size and age difference, our mother thought we were twins. 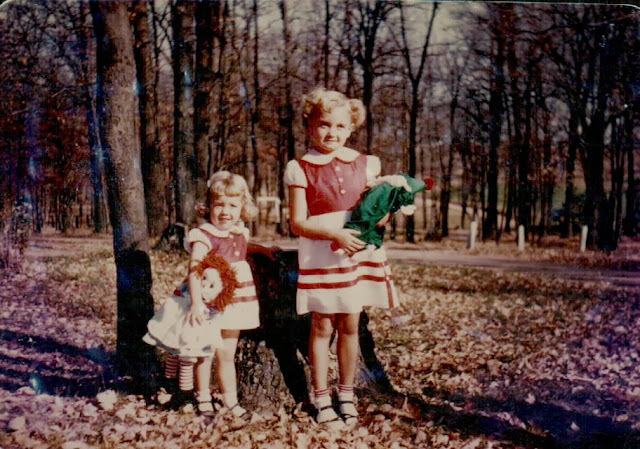 She dressed us alike until I needed big girl clothes and my sister was still in children's sizes. It all started when I was four and my sister was one. 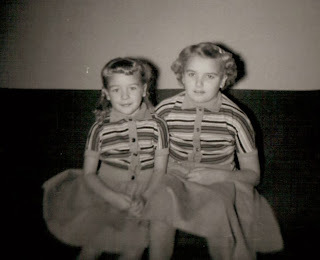 She started to dress us alike. 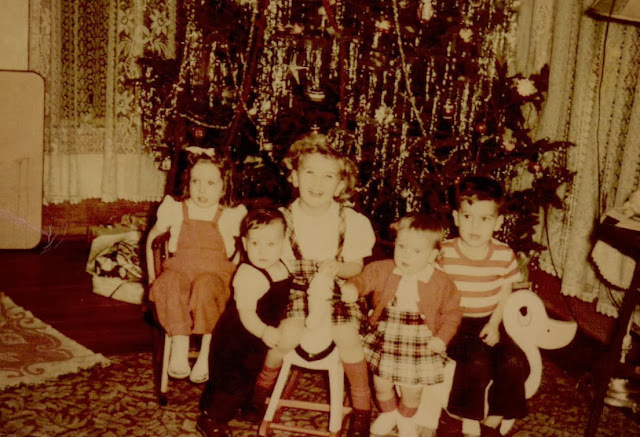 Carol Dux, Mark Anding, Me, Janice and Uncle Jeff Dux. Yes Jeff is my uncle even though he is younger than me. 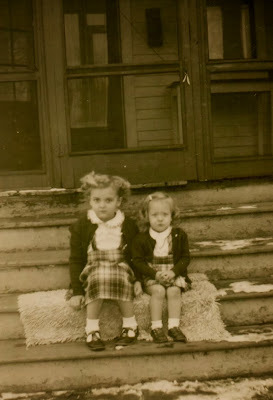 Then a year later they made us sit on a rug on the front porch. Notice the snow. This must have been the next year's Christmas photo. Mom always told me not to sit on cold concrete or I would get hemorrhoids. That's probably the reason for the rug. I think the next picture was taken in the same year. The porch is the same and so is my same horrible hairdo. No wonder I wet my pants everyday so I would be sent home from kindergarten, it was my embarrassment not that I was shy. My sister and I are dressed alike though. I was getting a belly even at age 5. 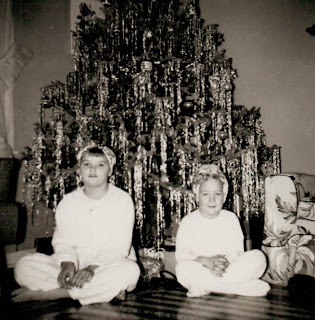 Then it was Christmas of 1954. My mom's best friend had made us Christmas stockings. 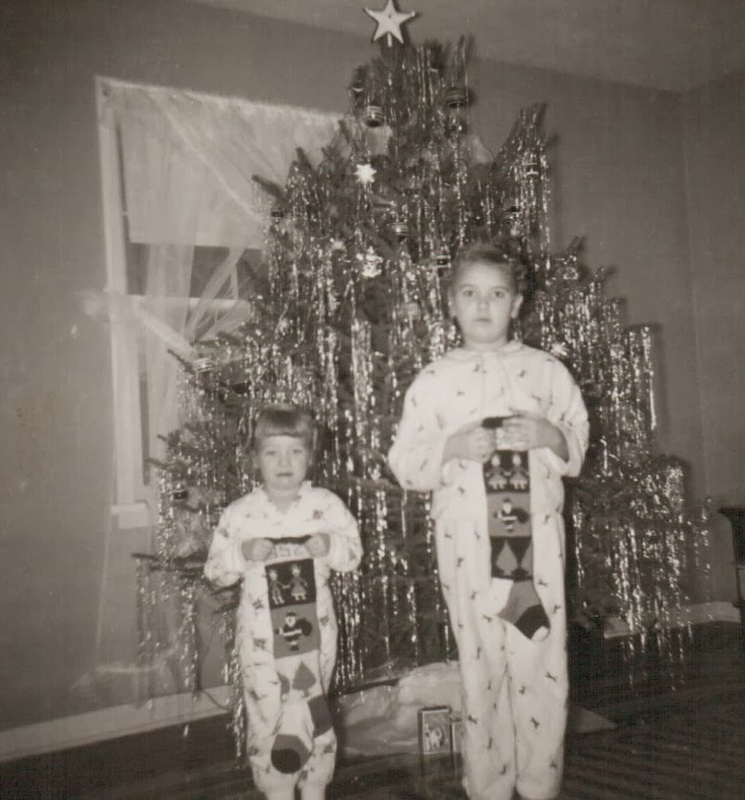 I still have the stocking and have copied the pattern many times. See our matching pajamas as well as the matching stockings. Mom continued the trend of dressing us alike. 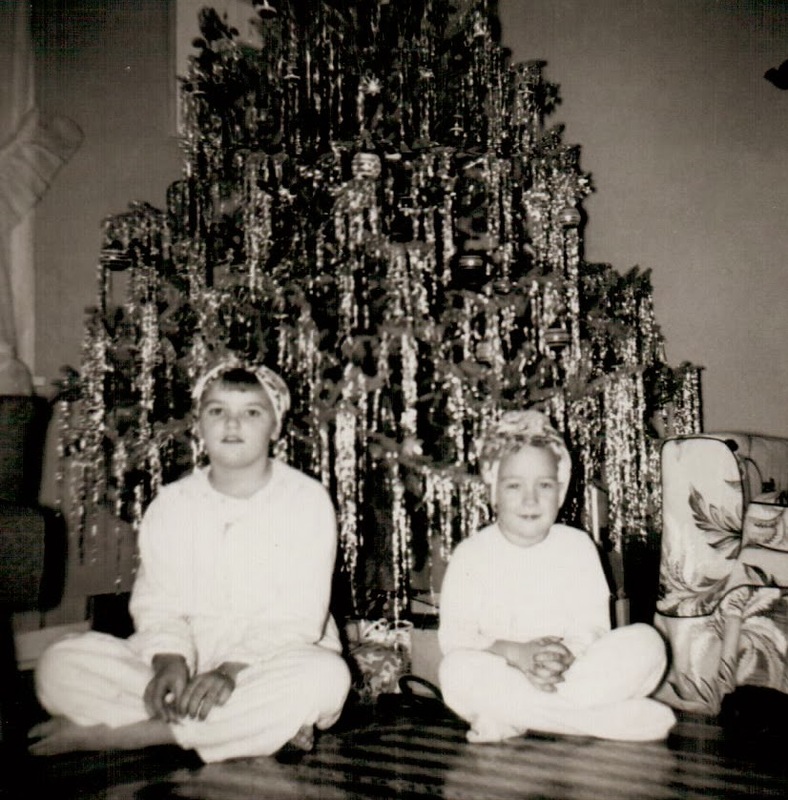 This next photo was taken at Christmas of 1955. 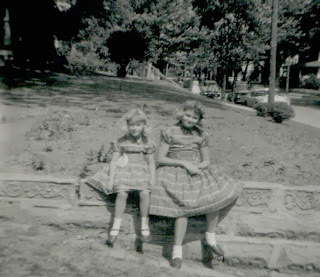 My sister had just turned five and I was eight. It looks like we even have matching pajamas again. Pin curls and a turban to keep them in place. Geez, I hope my hair turns out as lovely as it usually does. Good grief mom, what were you thinking. I do like the Christmas tree. All those individual icicles all over the tree. 1957 when we first moved to Stoughton Wisconsin. The matching theme continued. We have matching winter coats in this picture. This was the winter of 1958. That year our dad flooded a skating rink in the backyard. Often after school we would go outside and skate. Those were the days when kids played outside and entertained themselves without electronics. We barely watched television. I remember television stations only broadcasted a few hours everyday, not 24/7 like it is today. 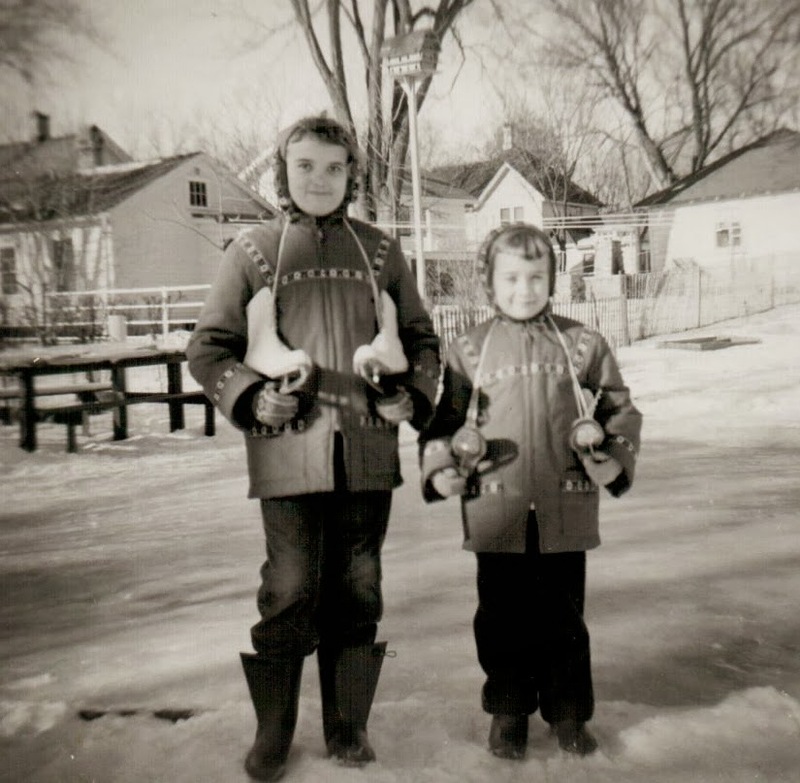 Posing with our matching coats and ice skates. 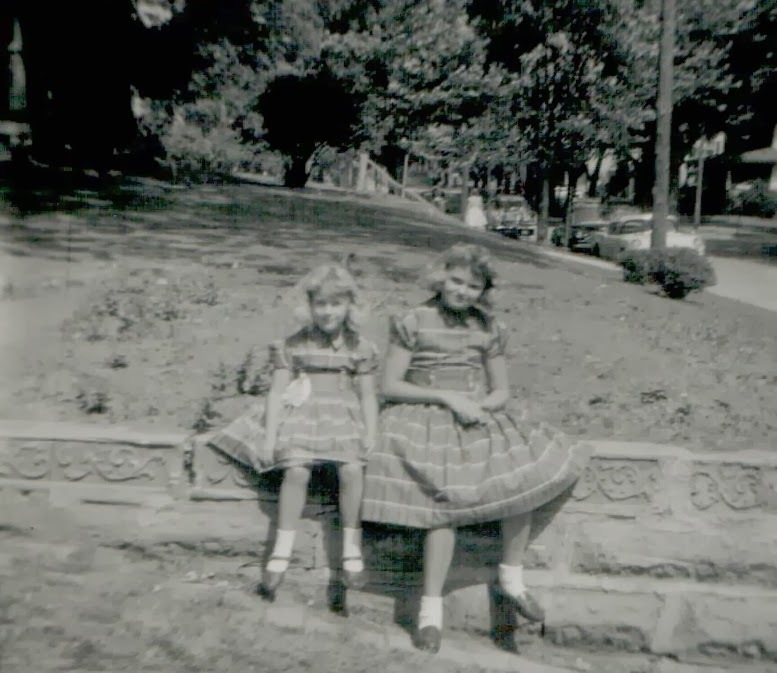 The next summer I was eleven and my sister was eight. We are still dressed alike. I could bore you with many more examples, but I won't. 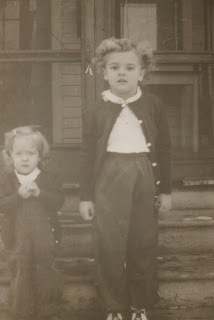 Mom ordered from the Montgomery Ward catalog, and she ordered the same outfits in different sizes as long as she could. Happy Birthday little sister. I hope you enjoyed the trip down memory lane.